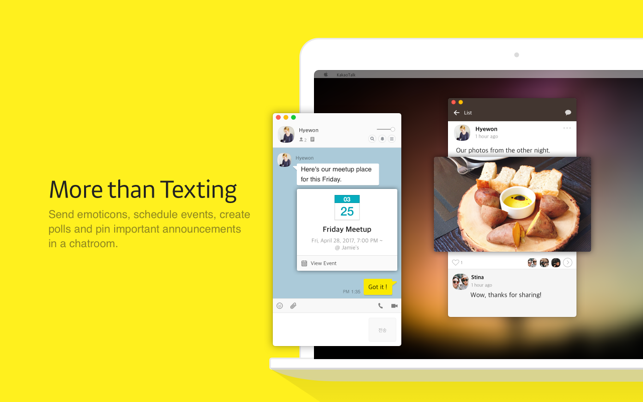 KakaoTalk is an easy, no-cost messenger that transcends standard chat. Make chatting extra fun with an array of emoticons and sticker collections. 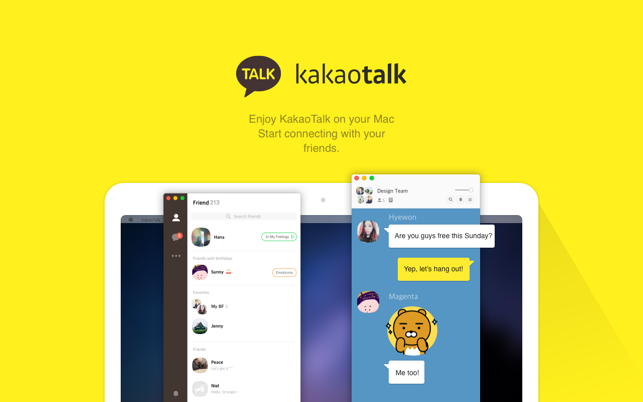 - KakaoTalk conveniently syncs your chats with your mobile device. Friends all over the world are never far from reach with KakaoTalk. Chat one-on-one or in a group, any time of day, as much as you like. 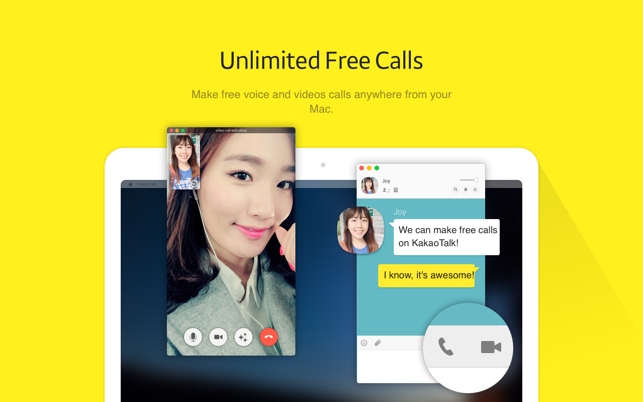 Make calls and video calls around the clock and around the world—for free! as well as our unique video filters. 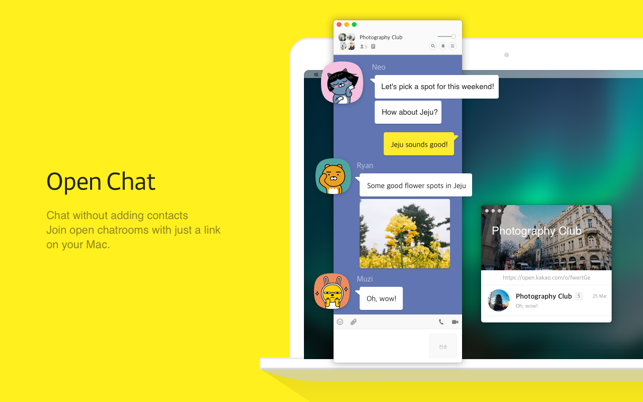 Share photos, videos and more with your KakaoTalk friends in your chatroom. Remote log out allows you to keep your KakaoTalk secure at all times – no need to worry if you step away from your desk in a hurry. 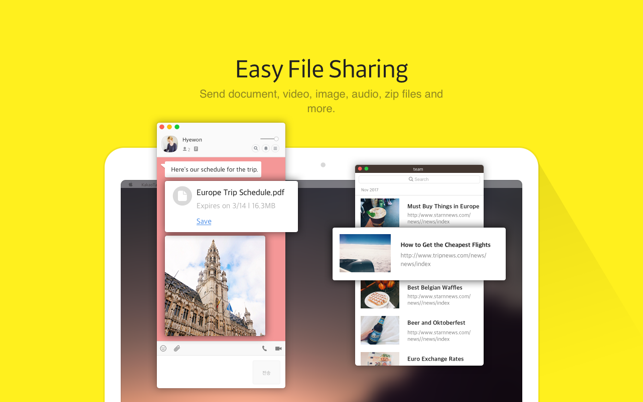 Plus enable lock mode to keep your data safe automatically. It’s a great app, as you can type with ten fingers and on a 11/13-inch screen, instead of two fingers and ~4/5-inch screens. It has made for improved efficiency in allowing you to collaborate with others, so you can get your work done in a shorter time. - Plus Friends/YellowID_ It is inconvenient having to check messages that have come from Plus Friends/YellowID only on the phone. - Search_ As of Kakao for iOS (~6.5.1), you can search for people even in the Chats window. It removed the hassle of searching in Chats for someone (with whom you find you had no recent chat history) and searching for him/her again in Contacts. I can’t think of more at the moment, but all in all I hope the Mac version will soon be on par with the PC version. Update: Works perfectly fine now. Thank you for all of your hard work. I'm unable to log into the Mac client with version 2.3.9. When I enter my correct credentials, I receive a system message saying that I've logged into my account on my laptop. However, on the Mac client I'm still in the login screen after I log in. This has been difficult and frustrating to use, and I'm not sure what the fix is. Pretty Good, but could be better! This is does pretty well stability wise though it could benefit from bringing more features from the PC and mobile versions. It would be a much appreciated to be able to carry over themes that you have on mobile to the desktop version. Currently you can just change the background of each chatroom (or all if you wish, but the text bubbles stay the same color giving an odd contrast between the two.